Unlike the Romney, Pawlenty, or Palin cliques, many of Huntsman’s staff and supporters are just getting to know him. And what Team Huntsman lacks in organization, it doesn’t make up for in diversity. The bus buzzed with clean-shaven young men, uniformed in button-down shirts and combed hair—a Rhodes candidate, Koch Foundation Fellow, Georgetown Public Policy Institute scholar, and a few former Mitch Daniels and Haley Barbour supporters, smiling like Olympians on the silver medal stand. There were a few young women, some from the College Republican National Committee. They “couldn’t officially endorse anyone,” they said—but sources in the Huntsman campaign assured me the organization’s chairman was totally on board. As we left the Washington twilight behind and hit the open road, the darkness began to lift. The sun rose on the horizon and someone’s ring-tone went off, beeping the theme from Star Wars—“a new hope.” But then, we arrived. The bus pulled into Liberty State Park with only a few minutes to spare before the speech. “Guys, we gotta hustle!” yelled organizer Patrick. Stephen, the organizer in the jersey, donned a Utah Jazz cape and delivered high fives as the group marched off the bus. But marching wasn’t enough. As we approached the tiny podium in the corner of the park, a suited Huntsman staffer jogged up. “Guys! We’re about to start his live-shot and we need everyone to run!” Shirts untucked, combed hair disheveled, the young Republicans charged forward into the breach. When the group arrived, I realized why. There was practically nobody there. Apart from a few hangers-on and the 50-plus journalists, our bus was pretty much the audience. In total, there couldn’t have been more than 100 souls at the tiny affair. With two minutes to go, a cameraman’s voice rang out from the back: “Wait! We have no power!” A flustered former Texas Congressman, Tom Loeffler, stepped up to the podium and the microphone went dead. Another voice yelled “count down, sir, count down!” A photographer next to me leaned in and chuckled, “Great way to start a campaign, huh?” Undeterred, a hopeful staffer shouted up to the congressman, “The power’s coming back Tom, it’s coming back.” Finally, as latecomers were shuffled into place, the microphone clicked to life, and the crowd politely clapped. In the small, relaxed group, no one stood more than 20 feet away from Huntsman himself. There was our busload, some law students, Huntsman family friends, GOP luminary Peggy Noonan, and a couple of guys from the New Jersey motorcycle club Ocean County Competition Riders. (Rocky Spano and Brian Hamilton, “his sidekick,” wanted to invite Huntsman, who rides motorcycles, for a ride and to give him a t-shirt.) I met one old Huntsman friend, Michael Skarzynski, who had worked with the ex-governor at the Department of Commerce. Skarzynski told me he wanted to join the campaign as an aide. It was unclear why he hadn’t yet done so, though many on the bus had worried in hushed tones about a recent New York Times profile, accusing the inchoate campaign of disorganization. Eventually, the young Republicans, tired but smiling, loaded themselves back onto the bus for the five-hour drive back to Washington. They had gotten their cerebral, moderate, not-bonkers Republican. But those looking for pomp, circumstance, and a well-rehearsed, energetic campaign event with hundreds of devotees in attendance—in short, an event that offered more hope for a victory in 2012—were likely disappointed. 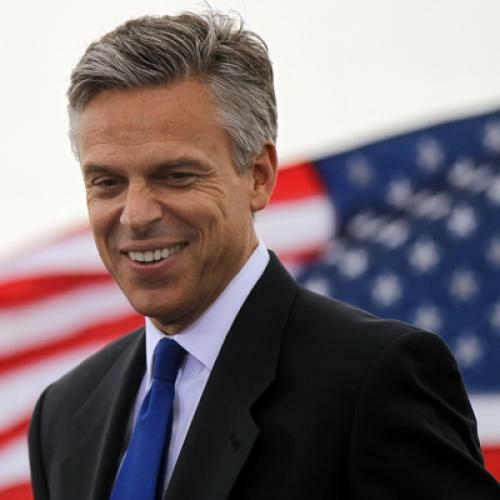 Beyond the bus, it’s not yet clear Huntsman has a real base for his presidential run.